After 50 years working as an advocate for low-income housing, Cushing Dolbeare says she is finally committed to working on just housing for a while. In 1974 Dolbeare founded the National Low Income Housing Coalition (NLIHC). She ran that organization from 1977-84 and 1993-94, and is now chair emeritus. She began her housing career in 1952 as assistant director of the Baltimore Citizens Planning and Housing Association and then spent 15 years at the Housing Association of Delaware Valley, first as assistant director and then managing director. In recent years she has worked as a policy consultant for numerous local and national housing organizations. For her undying commitment to finding solutions to America’s affordable housing crisis, Dolbeare has been called a legend and an icon. Andrew Cuomo, the former secretary of Housing and Urban Development, has called her “the Rosa Parks of housing.” In 2002 she was appointed Senior Scholar at the Joint Center for Housing Studies at Harvard University, and received the $250,000 Heinz Award for the Human Condition – an award she plans to donate to NLIHC. In April she will be honored at NLIHC’s annual Leadership Reception, “celebrating her first 50 years of housing advocacy and research on behalf of low-income families.” In February she sat down with Shelterforce to discuss her work, and the work of all affordable housing advocates. How did you get started in housing? My first interest in housing was when I was in high school. The Baltimore Sun ran a series called “Gems of Baltimore Architecture.” The “gems” were outhouses behind the row houses. There were pictures of rats. I wrote a letter to the editor and said that if they were allowed to proliferate, there would eventually be enough rats to make a rug from here to Philadelphia, and they published the letter. The summer after my last year in high school, I interned for a senator, and after college I got a job as one of [then-Senator] Hubert Humphrey’s speech writers. I remember writing a keynote speech for him for a National Housing Conference convention. I didn’t know much about housing, but I made it sound as if he did. When the Citizen’s Planning and Housing Association, the Baltimore housing advocacy group, offered me a job in 1952 I wasn’t particularly interested in housing, but I figured it would give me a chance to put something on my resume. I thought I would do housing for a couple of years and then find something more interesting. And you never found anything more interesting? Well, for at least my first 30 years in housing I was always waiting for that something more interesting to come along. My interest was always less in housing, more in addressing issues of poverty. Around 10 years ago I finally accepted the fact that I would keep working in housing. 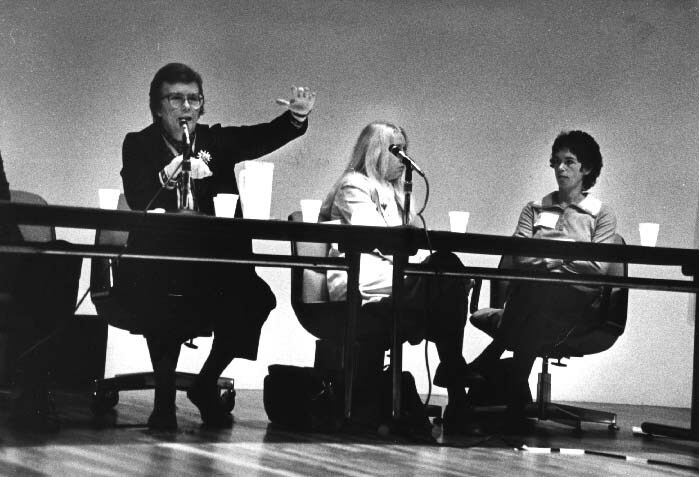 Cushing Dolbeare, shown here at a forum in the late 1970s (at left), has always been out in front on issues pertaining to housing advocacy.